Hey loves! I haven't posted in a few weeks because I'm recovering from a recent back surgery. All went well I'm just unable to move around as quickly as usual. BUT I refuse to let that stop me from enjoying FALL and all the fun activities that come with it! (would you??) As soon as I was feeling a little better I went out and picked up a few pumpkins for a fun DIY project. I saw the picture below on Pinterest (where else) and realized that I had a similar iron stand and loved the look of the metallic colors together. So I recreated my own version for my place! 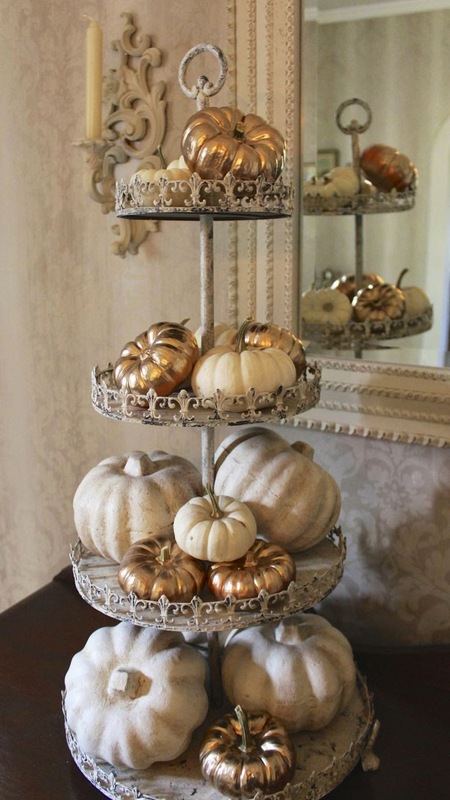 For this project I picked up a few faux pumpkins from the $1 store and some real smaller ones from a local grocery store. I chose to completely cover most of them with silver, gold, and bronze spray paint..half-dipped some of the white pumpkins, and left a few natural two-toned pumpkins as is. Below you can see the steps and completed look. For some added interest, I arranged some faux leaves as well as sunflower accents in between and around the pumpkins inside the basket.